Special graduation wishes are on your mind. Your child has successfully made it through high school and your thoughts and hopes are caught up in the lump of pride in your throat. Expressing this jumble in a manner that makes sense is a challenge. Are they entering the work force or going to college? For work, you can give them the tools they will need in their chosen field. Maybe an electrician's belt? Or cake decorating equipment? It all depends on what type of career they will be entering into. Those are very good ideas. Very practical. 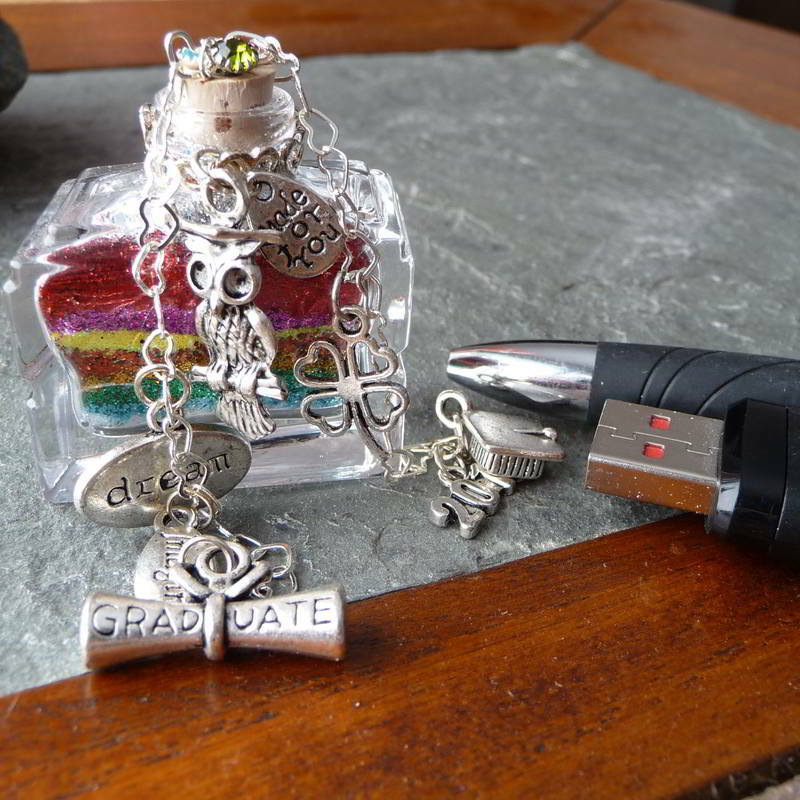 If the grad will be going to college there is an endless number of things they will need. Most of all, they will need money. Money for tuition. Money for books and supplies. Then there are the essentials like food, clothes and entertainment. But, like most people, you want to give something extra special. A token of your deep graduation wishes that really expresses how proud you are. A special gift that shows how much you appreciate the hard work and effort they put forth to successfully make it through twelve years of school. High school graduation gift ideas start with wishes. They are an adult now. You want to wish them the best of luck in the challenging world of adulthood. What if you could take all of your wishes and put them into one place? You have so many wishes that their hopes and dreams will all come true; can all this be neatly packaged to show them how much you care, how much love you feel and how much they mean to you? BECAUSE whether they realize it or not, they also need a spiritual boost....a daily reminder is nice. Captured Wishes has designed the perfect solution to this problem. With graduation wishes from Captured Wishes, you can show your grad exactly how you feel. You can wish them all of the luck and happiness in the world, but a few months down the road, when they are feeling lonely and homesick, they will have a hard time remembering everything you said. They may still remember the warm embrace you gave them as they turned and walked towards their future, but that will only make them miss you more. With a Captured Wishes gift, they can take it out and read the verse over and over. Instantly, their heart will fill with joy. Instantly, that warm embrace they remember in their head will surround their body, and make them feel good all over. All the loneliness will disappear as they hold the magical bottle in their hand and read the heart-felt words. And that is just what these magical bottles of pixie dust are designed to do – fill their heart with love and joy. To remind them of how much you love them and to show them that they are, and will always be, in your heart and on your mind. 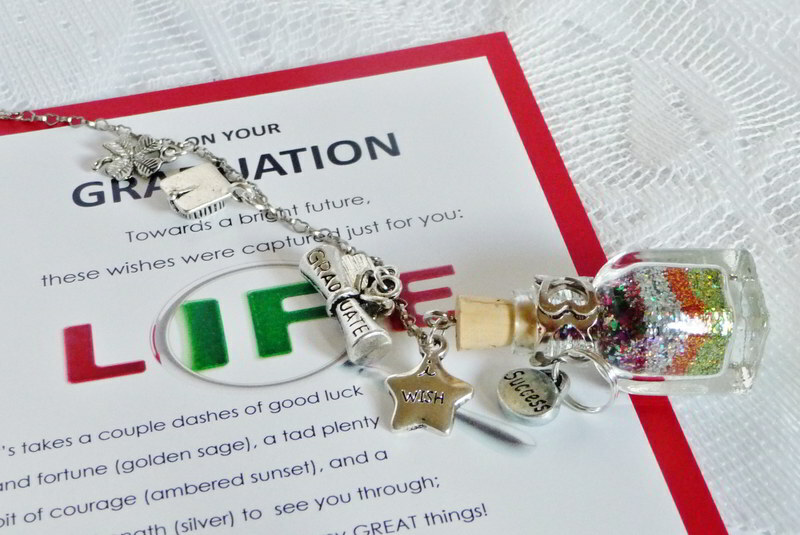 Your one of a kind graduation wishes gift is made with you and your graduate in mind. The pixie dust is layered with hopes (opal) and dreams (sky blue), and can be sprinkled with every bit of wonderful luck (green) that anyone could possibly imagine. Captured Wishes can also add good wishes for joy and prosperity. All of the wonderful things you wish for your new graduate are captured and presented in a unique, delightful glass vessel. What is a Captured Wish? Your special Captured Wishes gift is a special glass vessel filled with pixie dust that represents all of your love and warm wishes, a heart-felt verse and is topped off with magical charms. All of this is carefully packaged and shipped right to your door. Your son or daughter will be totally delighted when you give the little gift that says so much. Nothing says 'I love you' like a magical graduation wishes gift.